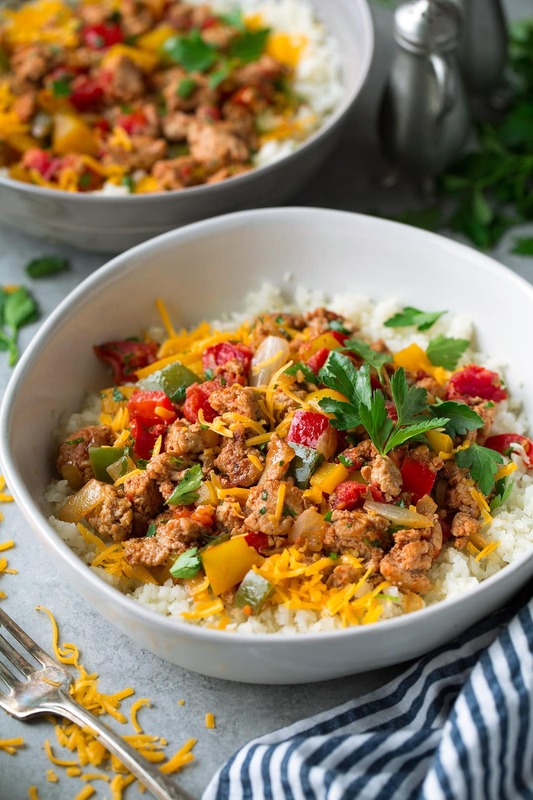 These Unstuffed Pepper Bowls made with Ground Turkey and Cauliflower Rice are seriously tasty and they couldn’t get any easier! These unstuffed peppers can be ready in 20 minutes, that definitely beats the traditional prep and time of the regular stuffed peppers. They taste just like an inside out stuffed pepper and they’ll definitely to leave you craving more! Why go with unstuffed peppers vs. stuffed bell peppers? 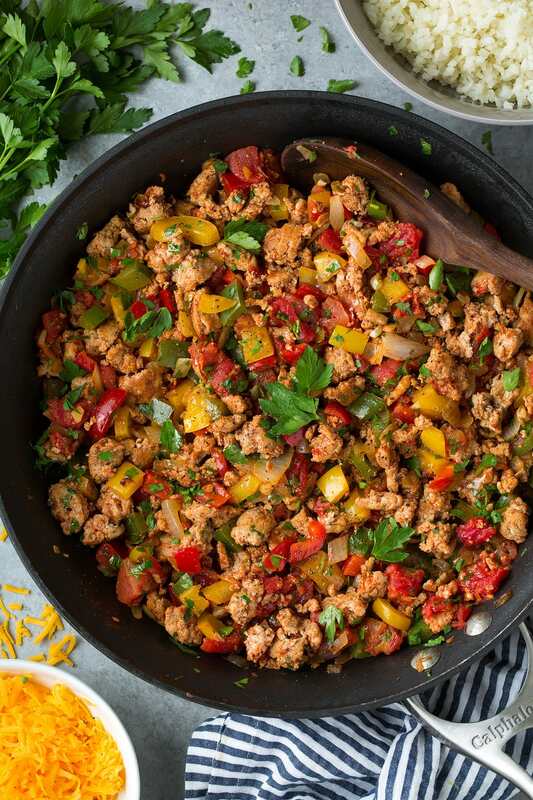 So instead of multi-step process of boiling peppers, making a white rice (and waiting the 30 minutes for it to finish), prepping a filling, stuffing peppers, then baking peppers, here you just saute everything in a skillet and serve it over a store-bought microwavable cauliflower rice. You save so much time (traditionally stuffed peppers take 60 – 90 minutes, here it’s about 20 – 25) and there’s also a lot less effort – less prep, less steps, less clean up, etc. BUT you still get all those same flavors! It’s the easiest dinner I’ve made in a while plus my family loved it so and I’m sure this will become a regular for around here! Ground Turkey or Ground Beef? Cauliflower Rice or White Rice? 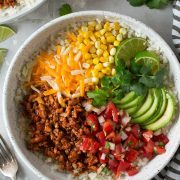 I also chose to make these bowls healthier than the traditional stuffed peppers by swapping the ground beef for ground turkey, then I used cauliflower rice instead of white rice. You could even nix the cheese but I don’t really know how to do that so ummm here we are. Bring on the cheddar! 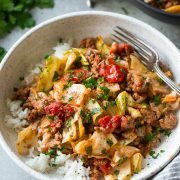 If lean ground beef and white rice are what you’ve got on hand you can definitely use those here as well, it’s just not quite as healthy. Leftover brown rice would be a great option too if you’ve got that in your fridge. Not only is this a great dinner but it’s the perfect recipe for meal prep. Make it on Sunday then have it for lunch for the next few days. The filling would also be great in tortillas – because tacos for life! 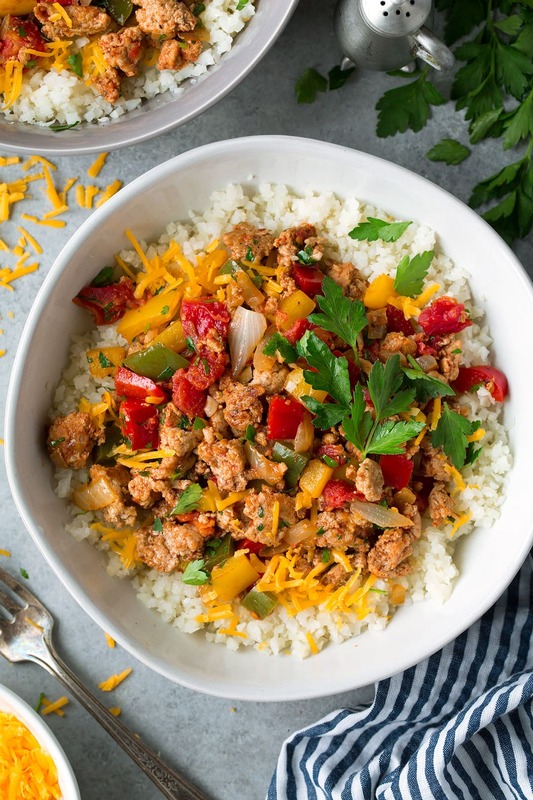 Bowls are layered with store-bought cauliflower rice (white or brown rice may be substituted), cheddar, and a seasoned ground turkey and bell pepper mixture. 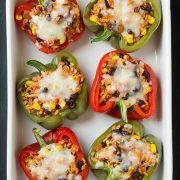 Just think unstuffed bell peppers - meaning all the flavor without all the time and hassle! Add onion and saute 2 minutes then add in bell peppers, season with salt and pepper and saute until softened, about 6 minutes. Transfer pepper mixture to a plate. Heat remaining 1 Tbsp olive oil in skillet over medium-high heat. Add in turkey in large crumbles, season with salt and pepper. Let rest, until golden brown on bottom, about 2 minutes then toss. Continue to cook and break up turkey, about 2 minutes more, until almost fully cooked through, then add garlic, chili powder, cumin and cayenne. Cook turkey through then stir in tomatoes and pepper mixture and warm through, about 1 minute. Stir in parsley. Plate cauliflower rice, top with cheddar cheese (I like to add it in the middle layer so it melts nicely), then finish with ground turkey mixture, serve warm.